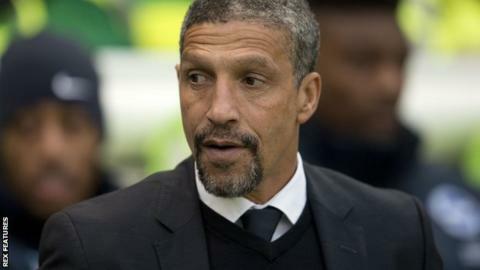 Brighton manager Chris Hughton says he cannot afford to get carried away with being top of the Championship table. The Seagulls remain unbeaten after 19 league games of the season - their best-ever start to a campaign. "You can't get excited about where you are," Hughton, who turns 57 on Friday, told BBC South East Today. "There are always difficulties and decisions you have to make. You can get excited by the level of performance but it is always back down to business." He added: "You play a game on Saturday and come Monday, you have to be able to close down that game and look for the next one." Having won 11 and drawn eight games so far this season, Brighton are currently two points clear of second-placed Middlesbrough. However, they face a stern test of their unbeaten record when they travel to third-placed Derby on Saturday, a match which Hughton describes as "toughest game of the season" so far. "They are on a wonderful run and have a very strong team," he added. "They recruited big in the summer and have expectations to get promotion. "They have a very good package in all aspects of their game and that is the hallmark of a great team. They have a resilience and quality right the way through the squad." Meanwhile, Hughton has praised winger Solly March after the England Under-21 international was nominated to win the Championship player of the month award for November. "He is very much contributing and he has been able to take it to another level," Hughton said of the 21-year-old. "What we have wanted from him is, apart from his natural ability, is assists and scoring goals. That is the area we still feel he can develop more. "Consistency can sometimes be difficult when you play in the position he does. He will have highs and lows, even in the same game.